Here's how you know when a restaurant's business is headed for a downturn. Restaurant stocks can make for awesome -- or awful -- long-term investments. 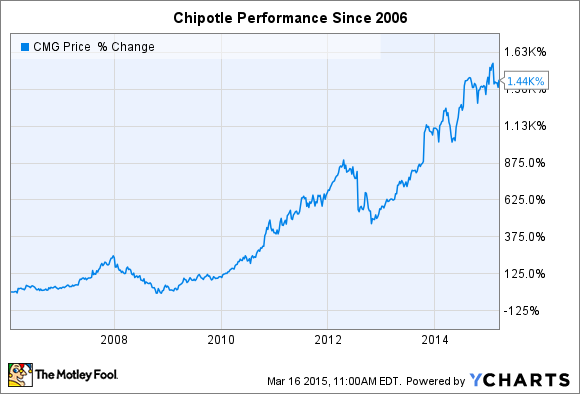 On the plus side, witness Chipotle's (NYSE:CMG) 1,400% jump since 2006. In less than a decade the burrito-slinger has tripled its store base to 1,700 locations. Each of those shops now generates a whopping $2.4 million of revenue per year, up from $1.4 million of average annual sales in 2005. On the other hand there's Olive Garden owner Darden Restaurants. The sit-down eatery has trailed the stock market by 20 percentage points in the last five years. And Darden just replaced its CEO and entire executive team as it struggles to recover from shrinking sales and a huge drop in profitability. While profit and revenue growth metrics are important for investors to watch, they aren't usually the first sign of trouble at a food service business. That distinction goes to declining customer traffic, the biggest red flag for restaurant investors. Do yourself a favor and ignore short-term profits -- especially per-share earnings. Those can be misleading, as profits often keep improving for some time even after guests begin shunning a restaurant's business. McDonald's (NYSE:MCD) recently demonstrated that point when it posted a seemingly sturdy 4% boost in earnings for fiscal 2013. That represented just a slight drop from the prior year's profit growth. But customer traffic figures over that period were telling a different story. McDonald's posted its first decline in guest counts in nine years in 2013. The traffic dip started out small, just 2%. But it has now grown into a major problem. Customer traffic plunged by 4% last year, which powered McDonald's first overall sales dip since 2002. Years after its first drop in guest counts the fast food giant is still struggling to get revenue growth back on track. Comparable-store sales, or comps, is a metric that tracks revenue growth at shops that have been open for at least a year. It strips out the effect of a growing or shrinking store base and focuses simply on an average restaurant's performance. Comps are widely followed because they provide so much information about the health of the business in just one number. They also allow you to stack one restaurant against another. Chipotle grew comps by 16% last quarter, compared to Buffalo Wild Wing's 6%. But all comps growth isn't equal. Gains that come through price increases aren't the same as growth that comes primarily from higher traffic. Investors want to see a balance between those two comps drivers, because it suggests a company has pricing power and is benefiting from growing popularity at the same time. Customer traffic flow can be a leading indicator of how a restaurant business will grow in the near future, particularly when it switches from negative to positive or vice versa. Looking forward, the figure suggests we can be optimistic about Panera Bread and pessimistic about Noodles & Company right now. Panera in February posted its third straight quarter of traffic growth after shrinking last year. Meanwhile, Noodles & Co. just booked its second consecutive quarter of negative guest traffic. This one metric doesn't tell you that this noodle chain is a sell. But it does give investors a good reason to do more research on the stock before becoming shareholders.